When choosing structural connectors in Chino CA, you need to consider the size, shape, strength, and type of connector for your unique application. For exterior applications such as decks, you’ll also want to consider whether or not the connector will be able to resist corrosion when exposed to the elements. At Grove Construction Hardware, we offer a nice selection of corrosion-resistant structural connectors, including galvanized zinc connectors and special Gold Coat structural connectors from USP. 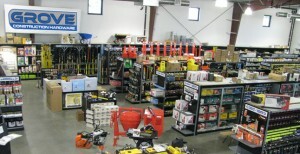 To learn more about USP technology, or to get answers to any questions you may have about sourcing your connectors, just give us a call or stop by our store to consult one of our knowledgeable sales reps.
At Grove Construction Hardware, we take pride in being the number one choice for contractors in southern California. Because we work regularly with contractors, we have a broad selection of structural connectors in Chino CA that you might not find at your average hardware store. In addition to the connectors themselves, we can also provide virtually any other type of fasteners or tools you may to install them, as well as building materials and safety equipment. We know that time and money are a concern for contractors, so we make sure you get your hardware and supplies quickly and at a competitive price. Ask us about volume discounts. Please contact us to learn more or to place an order.